DeM Banter: Sure could have used this one yesterday…really curious how this will filter down and what the 3rd and 4th order effects will be. Totally applaud the effort…but not sure it will survive first contact with any general officer outside the CSAF’s staff–but then again… I tend be wrong….a lot…. If it sounds stupid, don’t do it, Chief of Staff Gen. Mark Welsh advised airmen, supervisors and commanders Tuesday. The service has hundreds of instructions, many of which have not been updated in a long time, he said. It may come as a surprise to some airmen that they don’t have to follow outdated guidance, but Welsh insisted he is “dead serious” and added the heads of the major commands understand the need to empower airmen to do what they think is best. Going forward, one of Welsh’s concerns is retention, especially of flight-rated airmen. If the Air Force does not give them the training and resources they need to be the best, they will opt to leave the service, Welsh said. The Air Force is so concerned about this that it recently offered about 250 eligible fighter pilots a $225,000 bonus in exchange for a nine-year commitment. 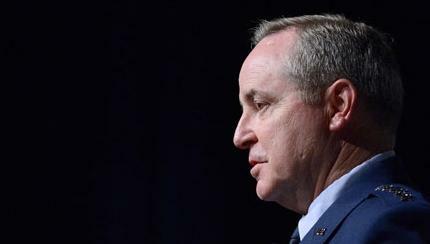 Welsh said he is concerned about another challenge airmen have to grapple with: boredom. Budget cuts led the Air Force to ground several squadrons this year. When Welsh visited one base recently, a maintainer said he was bored and planned to leave the service after his required four years. At the beginning of his speech, Welsh offered his condolences to the Navy and those affected by Monday’s shooting at the Navy Yard in Washington, D.C. Twelve people and the gunman were killed.